Simply complete the form below to download your free copy of these tools. The power of great teamwork has the ability to leverage a business in countless ways. 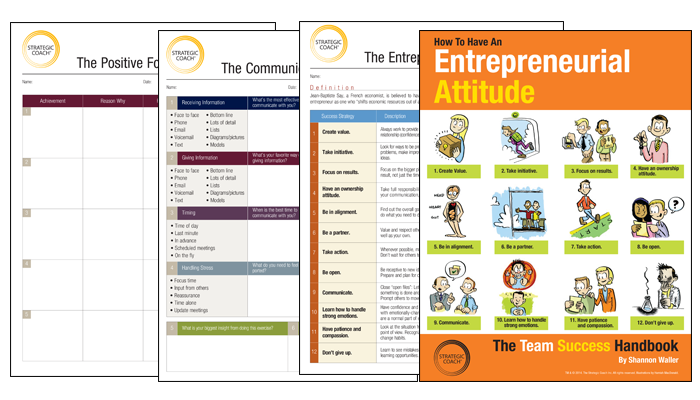 Get your team connected and playing at the top of their game using these four transformative tools: The Entrepreneurial Attitude, The Communication Builder, The Positive Focus®, and The 12 Strategies. In this team exercise, learn the 12 key strategies for success in an entrepreneurial company and develop your results-oriented attitude and mindset. Learn the nuances of how to best communicate with others in this exercise that highlights how you prefer to give and receive information, the best time to communicate with you, and what you need when you’re stressed. Focus on your achievements in order to maintain your confidence and stay in the positive zone. It takes a certain mindset to be able to succeed in an entrepreneurial organization. Get the 12 strategies for having an Entrepreneurial Attitude and succeeding in an entrepreneurial business.